Welcome to Wine Quiz number 11. Please choose from the list of possible answers to each question. 1: Okanagan is a region in which wine country? Okanagan is the most important wine region in British Columbia, Canada. 2: What is Vitis labrusca? This is another member of the family of wine grapes. Vitis vinifera is the main wine grape, but labrusca is common in North America. Umami is the fifth taste/flavour, identified by Japanese scientists originally and described as a savoury or ‘brothy’ flavour. 4: the well known wine brand Casillero del Diablo means what? Meaning the Devil’s Cellar, the brand belongs to Chilean giant Concha y Toro. 5: The grape ‘Tinta de Toro’ is also known as what? This is one of many synonyms for the grape Tempranillo, as used in the Toro region of Spain. 6: which of these is a real wine? Marylin Merlot is made by Marilyn Wines in the Napa Valley, California. 7: when a winemaker talks of ‘must weight’ what does he or she mean? Must wight refers to the sugar concentration in grape juice, an indicator of the eventual alcohol potential of the wine. 8: which country’s wines bear this stamp of approval? This is the stamp of the highest quality wines produced in Canada. 9: which is the odd one out? Setubal is in Portugal, just south of Lisbon. All the rest are in Spain. 10: where is the Willamette Valley? This is the most important wine region of Oregon in North America, home of Chardonnay and Pinot Noir amongst others. 11: Which is NOT a renowned Riesling growing area? The Hunter Valley in Australia is renowned for Semillon, not Riesling. 12: What does ‘Cosecha’ mean on a Spanish wine label? This indicates the year of harvest – the vintage of the wine. 13: What is the purpose of this device in a vineyard? 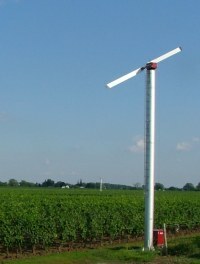 This small turbine moves the air across the vineyard during periods of frost, reducing risk of damage. 14: a winemaker could use a ‘spinning cone’ to do what? This piece of machinery is part of the process to reduce the alcohol in a wine, used by some wineries. 15: Where is the Waiheke Island wine region? Waiheke Island is a short ferry ride from Auckland. Trentino has a border with Austria, Puglia lies in Italy’s ‘heel’ in the far south. 17: The blend is Macabeo, Parellada and Xarello. What’s the wine? These are the classic, local grapes used to make Cava, the Spanish sparkling wine. 18: If you drink 8 large (250ml) glasses of wine at 14% ABV per week, how many standard UK units of alcohol have you consumed? That equates to 28 units of alcohol. Lafite is a 1er Cru, Lynch-Bages is a 5eme Cru. 20: What is the world’s most southerly commercial vineyard region? Central Otago claims this title at 45 degrees south.